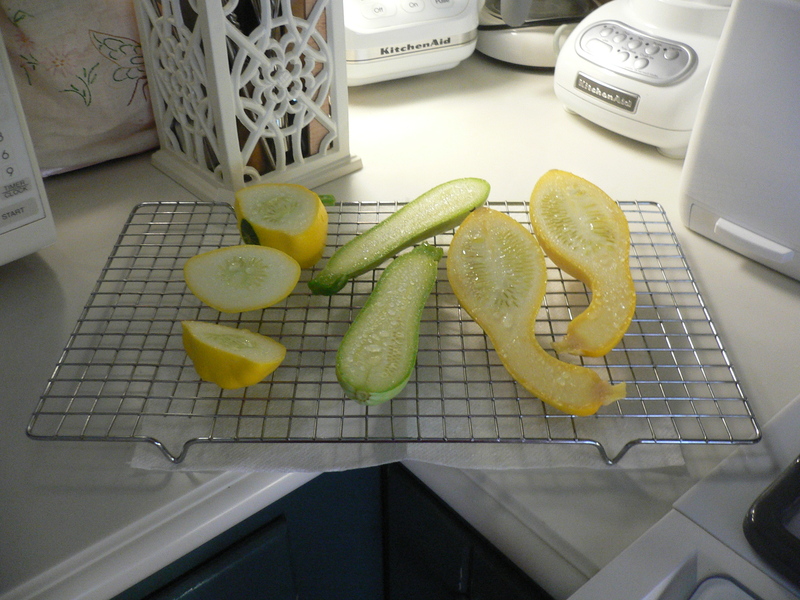 Perhaps everyone is dying to know which color seed produced which color pattypan squash. Well, perhaps not. But I know I am. 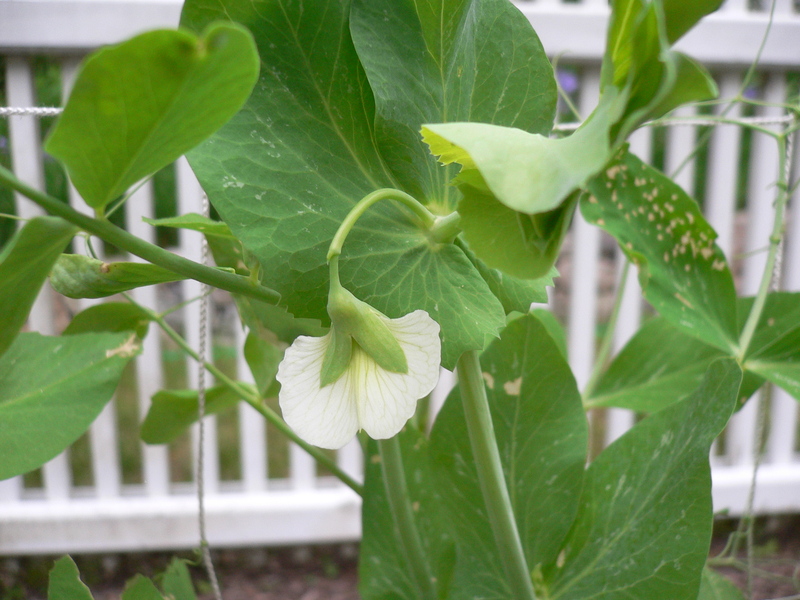 As some may recall, we started the pattypans rather late in the season with a packet of seeds we picked up at Adams Fairacre Farms (see May 9, 2014). 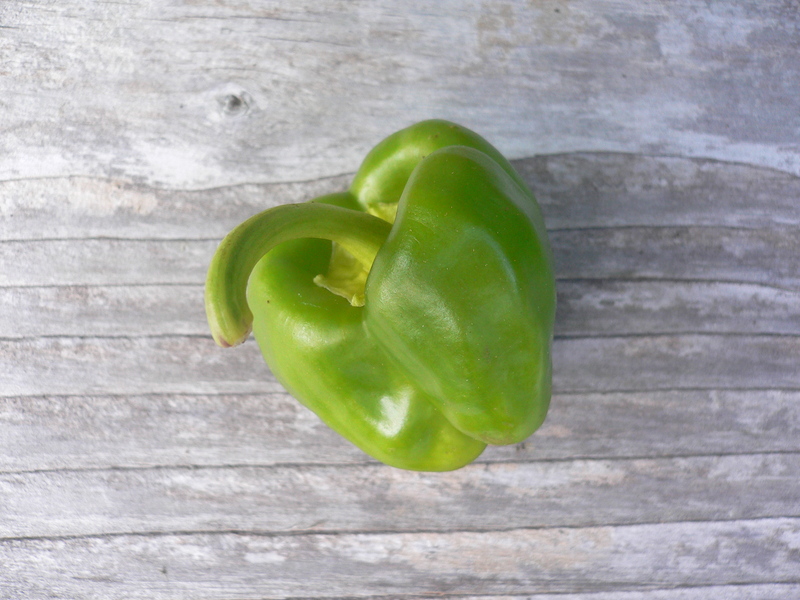 The variety was labeled “Tricolor” and to be helpful, the producer dyed a third of the seeds red and another third green. Whether the dye choices are some kind of homage to the Italian flag was not immediately apparent. 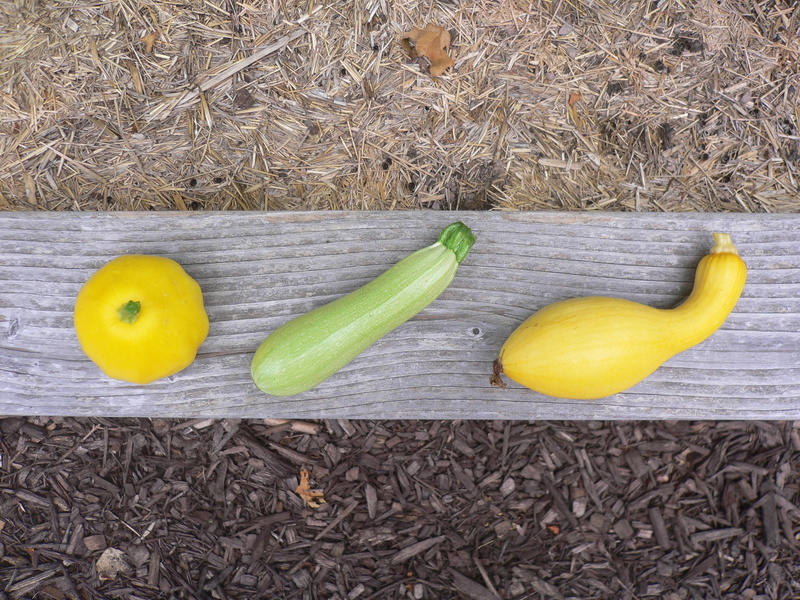 Presumably, the tricolored seeds are to tell the tricolored squash apart. Unfortunately, the seed producer did not provide a key. Almost entirely arbitrarily, I mapped buff (undyed) seeds to white pattypan squash, the green seeds to green squash (how’s that for going out on a limb? 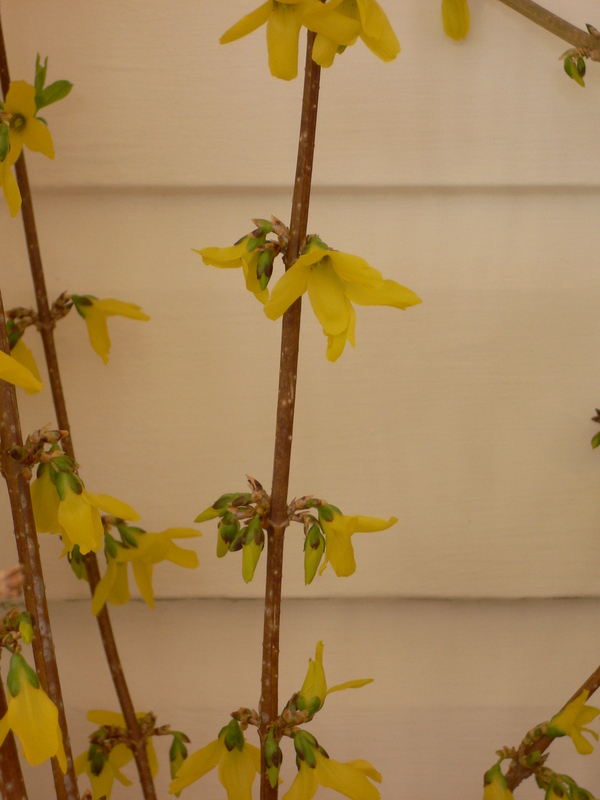 ), and, by process of elimination, the red seeds to yellow fruit. 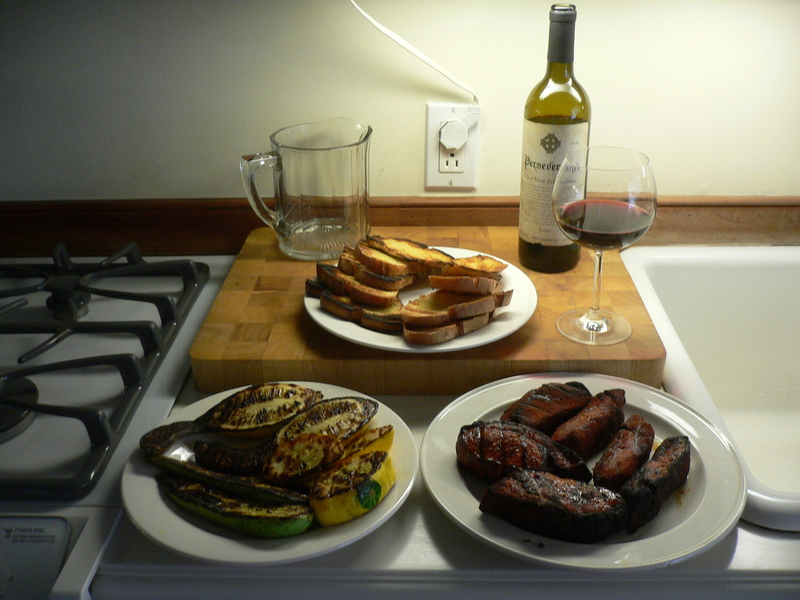 The last pairing was the least obvious choice because red is not a color usually associated with summer squash. 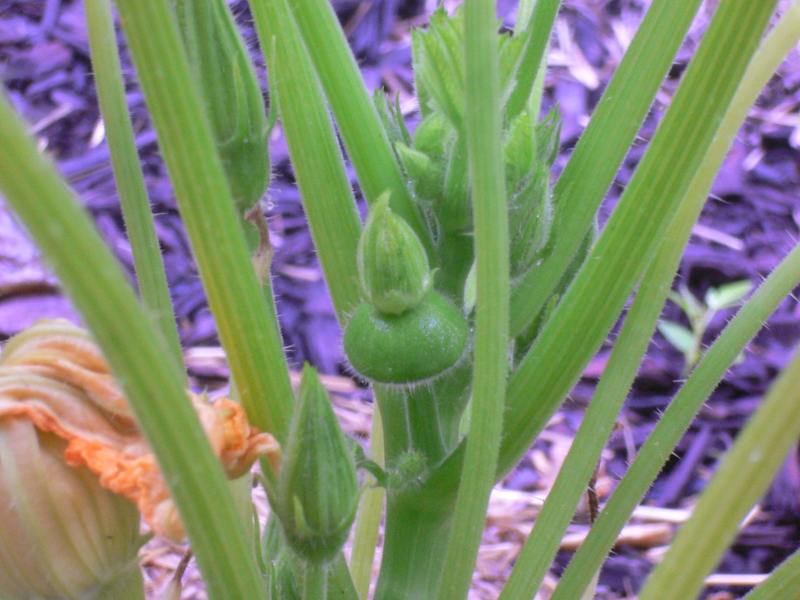 Also, one could argue that the buff-colored seeds are a variation on yellow and, hence, should produce yellow fruit. However, I did say my choices were mostly arbitrary. Thinking ahead, I labeled each pot in which I sowed a pattypan seed with the seed color which it contained (see May 26, 2014) and then, when setting the seedlings out, drew a sketch to keep track of where each seedling was planted (see June 8, 2014, part 2). I wanted no ambiguity. 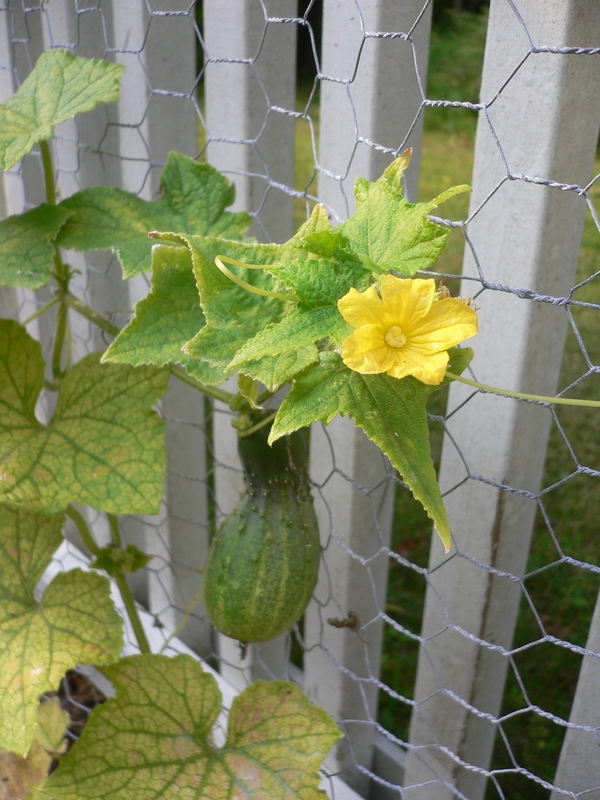 So, now that the squash vines are starting to bear fruit, I have my answers. And—(drum roll)—it turns out my carefully formulated hypotheses (by which I mean my guesses) were correct. Well, two out of three, anyway. A red seed did, in fact, produce a plant bearing yellow pattypan squash and a green seed did actually produce a plant bearing green ones (we ended up with only one vine of each color). 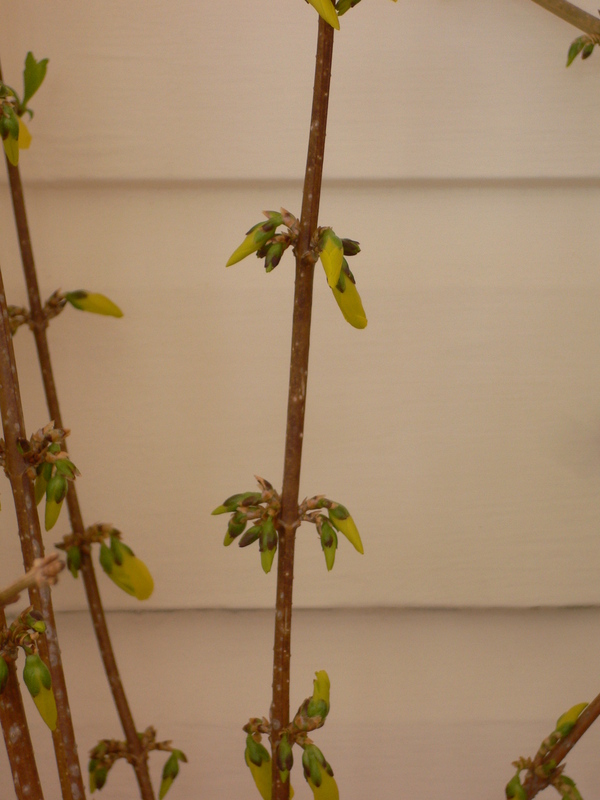 Sadly, though, the plant that sprang from a buff-colored seed is not looking well and will not likely survive. 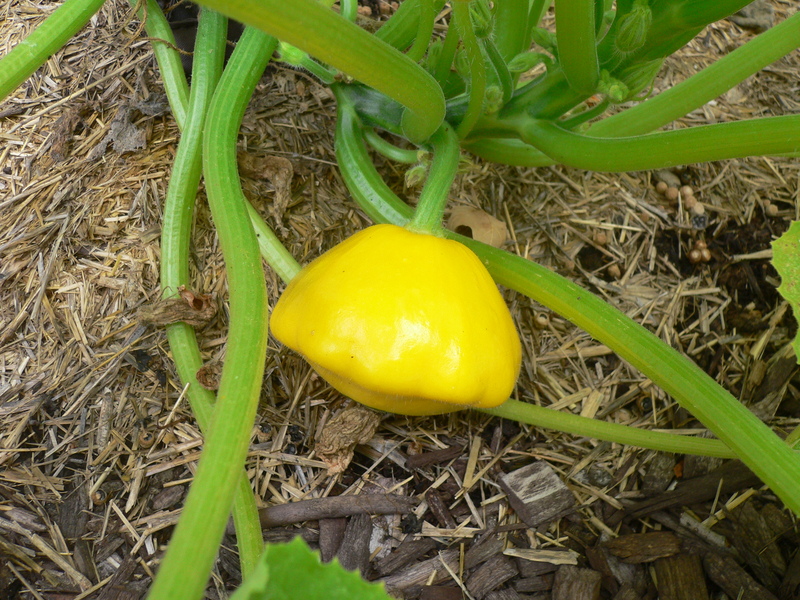 It’s probably safe to assume (if that is not an oxymoron) that the third plant, grown from the buff seed, would have produced a white pattypan squash (and too bad that we didn’t get any; white squash would look cool). But confirmation will have to wait until next year. One of the ways I know that spring has arrived is that for the next few weeks, the sun will shine directly through my office windows. With no leaves on the trees to filter it, the bright light makes it difficult to see the screen of my computer but the solar heat on my face feels great. 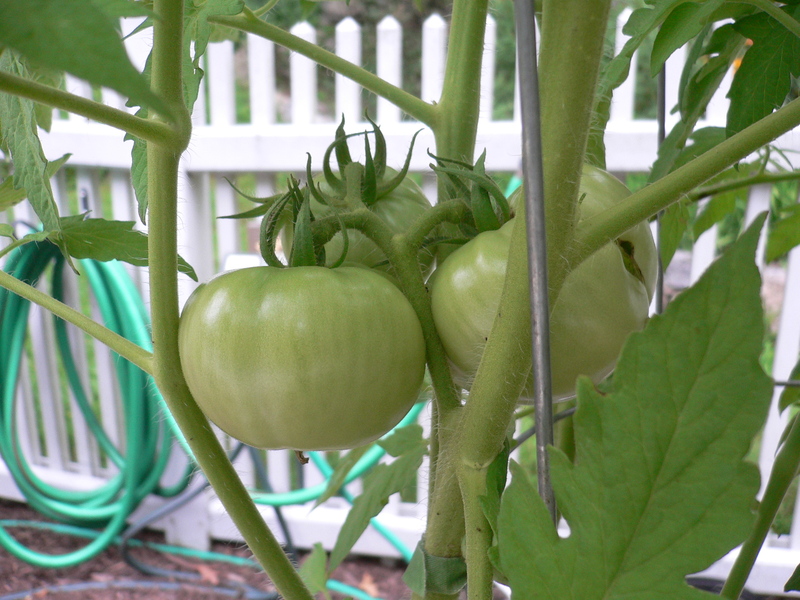 Another indicator that spring fever has hit is my desire to get out into the garden and start doing something. The draw is getting stronger every day as more snow melts to reveal another task that needs attending to. 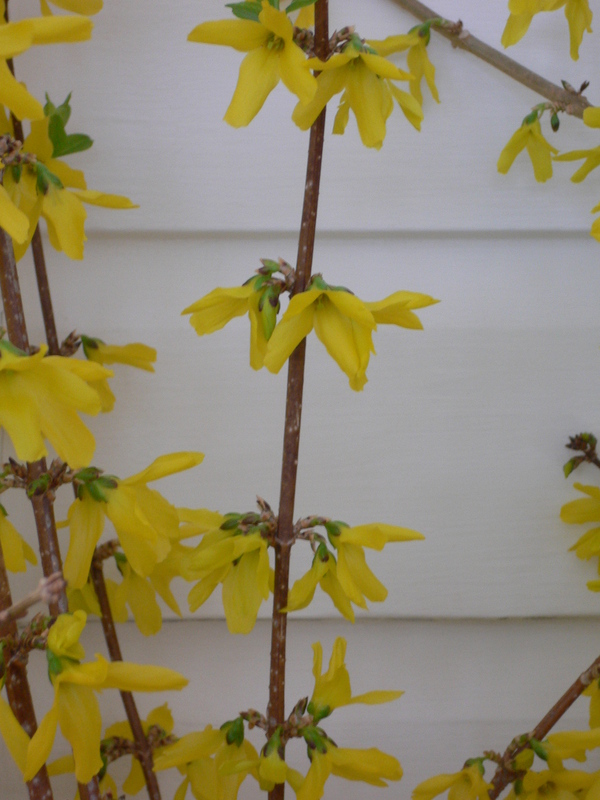 This was a rough and stormy winter and consequently, the yard is in disarray. Order must be restored! In other words, it is time for spring cleaning. Most of our work over the next week or two will be in the ornamental gardens. 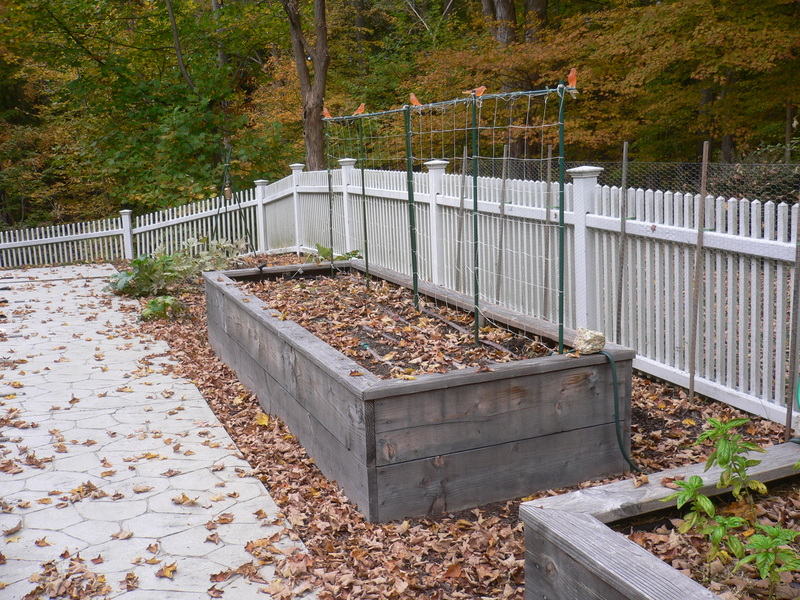 We don’t do a lot of cutting back in the fall—usually, only enough to facilitate leaf removal. In particular, we leave the black-eyed Susans and butterfly bushes in their bare-branched state to provide decoration and keep the garden from looking too empty. It is pretty, especially against the neutral background of winter white (i.e., snow), but as a result, the gardens are filled with dead wood. To make matters worse, heavy snow came early this year and buried some of the plants we might otherwise have tidied up in the fall. These include the hostas, Siberian and bearded irises, and day lilies. In other years when we have left them, the faded leaves look crumpled and haggard by spring; this year, being crushed by snow for three months has done nothing to improve their appearance. 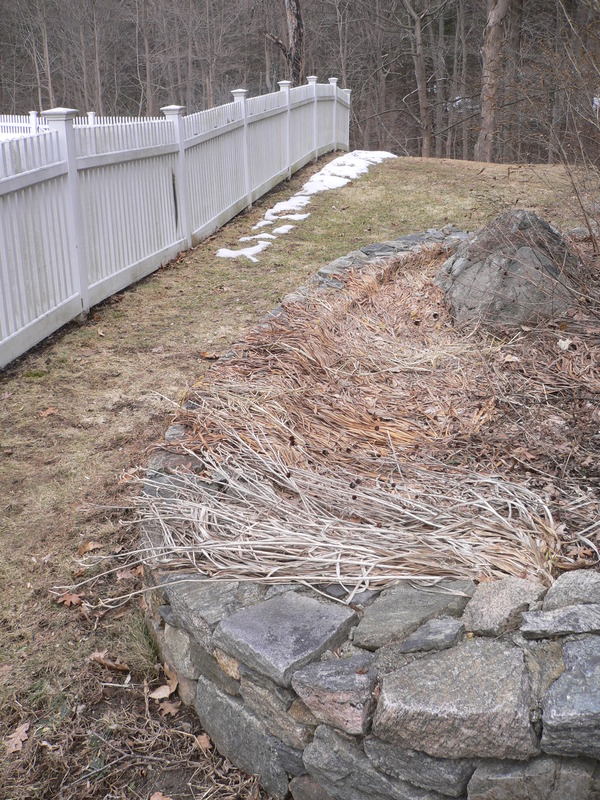 The first order of business, then, will be to trim everything back to make room for new growth. Clearing away last year’s detritus will also allow the sun’s warmth to activate the bulbs and rhizomes that have been lying dormant since the fall. In fact, small, spiky leaves are already poking up amongst the matted clumps of spent bearded iris leaves and I spy, with my little eye, a crocus peeking out through the cloud of desiccated Russian sage bushes. I have some reservations about jumping back into it. 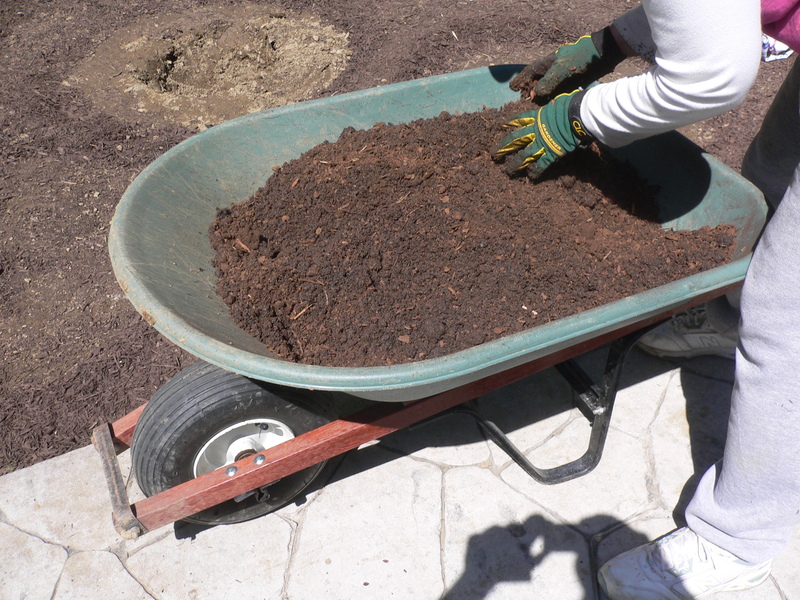 Yard work is physically demanding and can be overwhelming (it sometimes feels as if the entire world needs tidying up after winter). But I know that it will also be immensely satisfying, a literal cleaning of the slate as we start the new gardening year. Finally, a crack in the ice, a fissure in the hard shell of cold that has been this winter. With temperatures in the upper 40s and a splash of warming sunshine this weekend, winter has moved on, having overstayed its welcome by a week. It left some baggage behind—there is still more than a foot of snow on the ground. The continued warm weather will get to work on that, slowly, but it will be another week or two before it is all gone. The mountainous piles of snow in mall and supermarket parking lots—some of them six feet tall or higher—will take even longer to melt. The thawing is a reassuring reminder that the seasons do change and that soon enough (or maybe not, for some people) the polar vortexes will recede back into the artic where they belong. Until then, we must continue to prepare for warmer weather and the outdoor growing season that comes along with it. 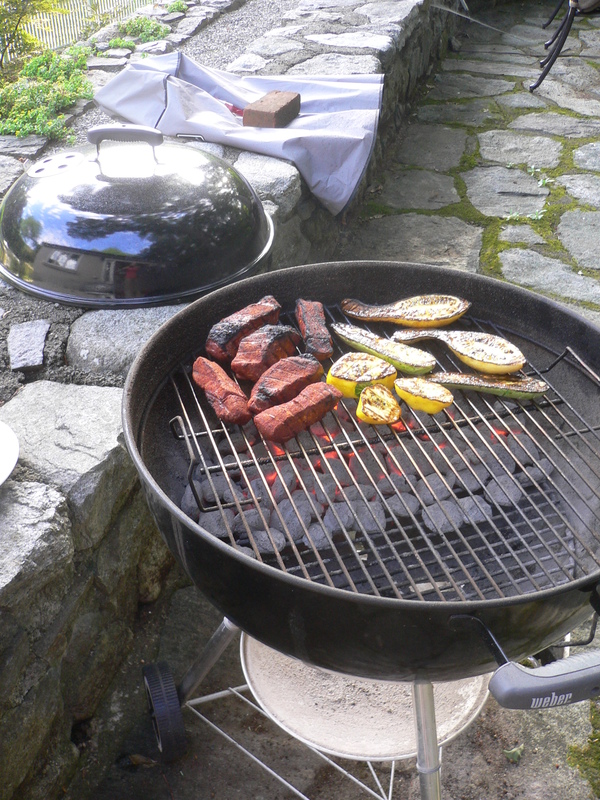 Of course, there is nothing yet that can be done outside in the garden. Indoors, however, plenty of tasks need attending to. The basil, rosemary and first sowing of lettuce have all unfurled their first set of true leaves. By now, they have probably used up most of the energy stored in their seeds. I mixed a little fish emulsion with water in a spray bottle and gave all of them a quick boost. Not long from now, I will pot them up. According to the seed sowing calendar, I am a little late starting the eggplant and bell peppers, but only by a few days. I filled another half-tray with soil mix and planted six eggplant (Black Opal) and twelve bell peppers (six Orange Sun and six Quadrato d’Asti Rosso). We now have one and a half trays of seeds and seedlings warming on the heating pads. Gardening is not all glamor and glitz. In addition to sowing seeds, repotting seedlings, building compost bins, and other photogenic activities, there are less tidy chores that must get done. For example, before starting on the sowing today, I washed up the small plastic and terra cotta pots that were still dirty from last year’s use. It wasn’t a pretty sight when I began but it was immensely satisfying to see the results of my spring cleaning. Having harvested the last of the string beans (see September 25, 2013), we decided it was time to clear out the vines and start readying the west planter for winter. 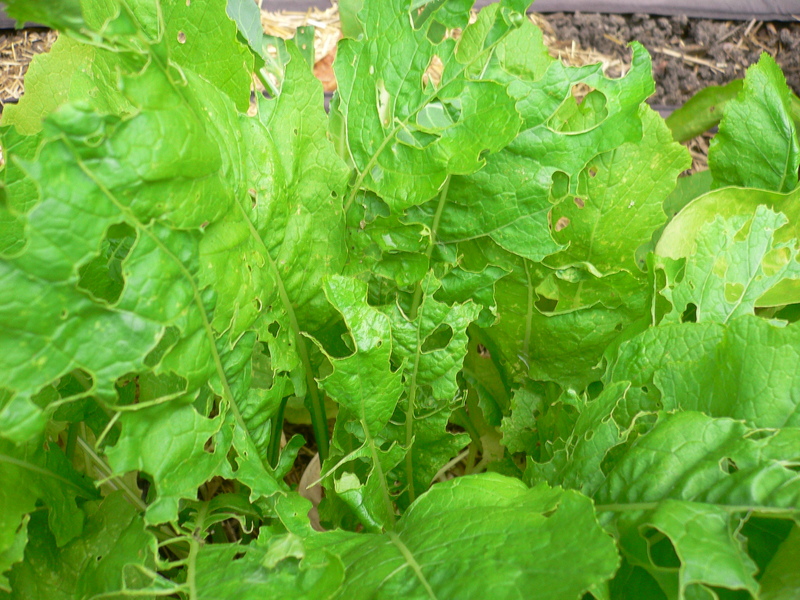 Some gardeners would chop up the vines and till them into the soil to decompose and add organic matter (so-called green manure or green fertilizer). Others might cut the stems off at the ground surface and leave the roots in place, hoping that symbiotic bacteria (if present) would continue to fix Nitrogen in the soil. But neither of these ideas appeals to me. 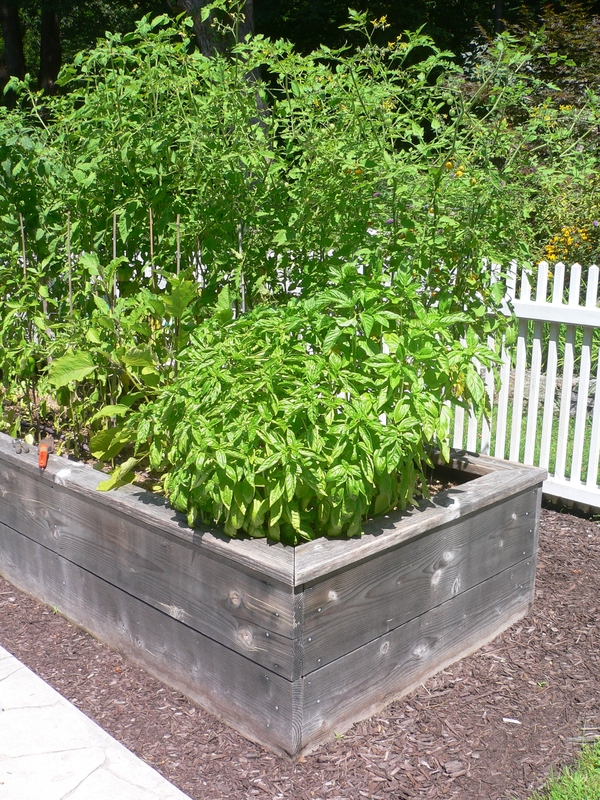 Even though the planter is not that big (four feet by 12 feet), turning the soil would be a lot of work. And anyway, we are following the no-till approach, which moderates decomposition, improves drainage and minimizes weed growth by leaving the soil surface undisturbed. Somewhat ironically, it also maintains better aeration by eliminating compaction and encouraging the earthworm population. 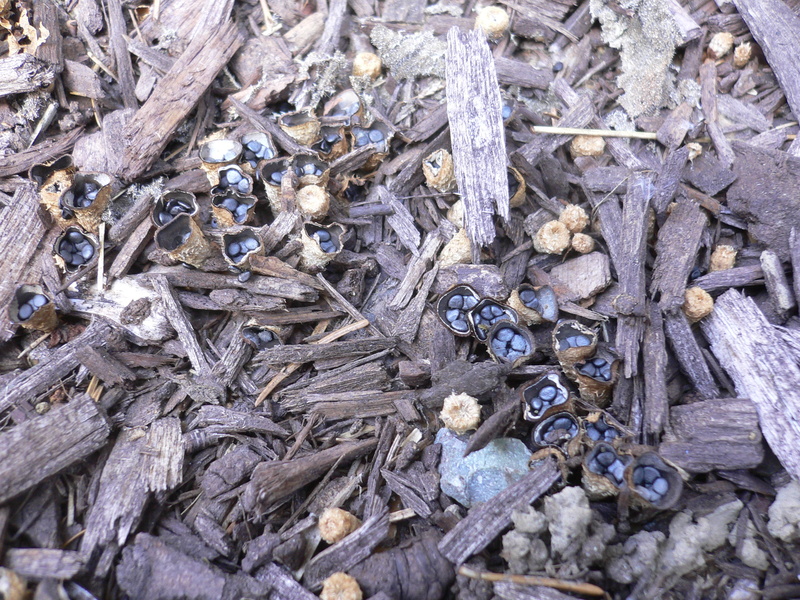 In fact, our soil is essentially turned over several times a year by an abundance of energetic Lumbricidae. Leaving the roots in place would require less effort—even less than pulling them out. However, we do not necessarily have Nitrogen-fixing bacteria and it is not clear that they would have enough time to make a significant contribution to the properties of our soil. 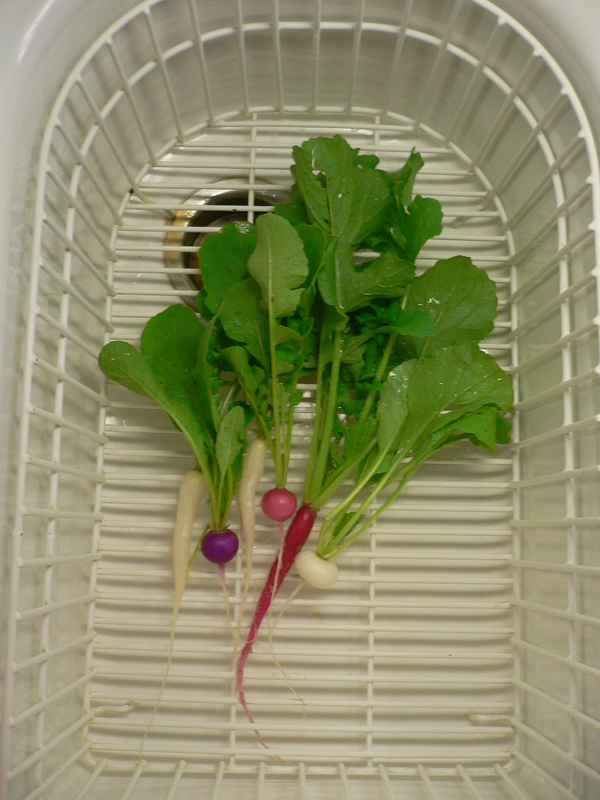 Besides, it is more likely that we have too much Nitrogen rather than not enough (see June 22, 2013), as evidenced by our crops of carrots, beets and radishes which produced more leaves than roots. Being completely honest, it probably wouldn’t matter if either alternative had a scientific justification because pulling the vines out is more in keeping with my nature. I have been described as a neatnik and it is a characterization I do not deny. At a certain level, getting the planter tidied up for its long winter nap is much more important to me than ensuring that the soil has a proper concentration of Nitrogen. Our soil’s nutrient distribution can be adjusted in other ways and at other times but I have to look at the empty planter all winter long. 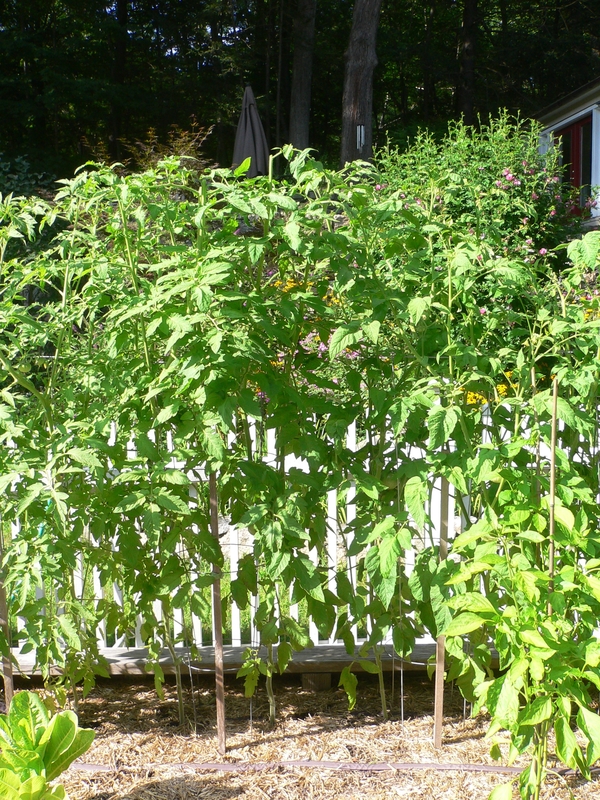 Okay, I admit it: I let the tomato vines get away from me. I was aware of the impending problem and had adjusted my action plan accordingly (see August 20, 2013) but then I failed to follow through. 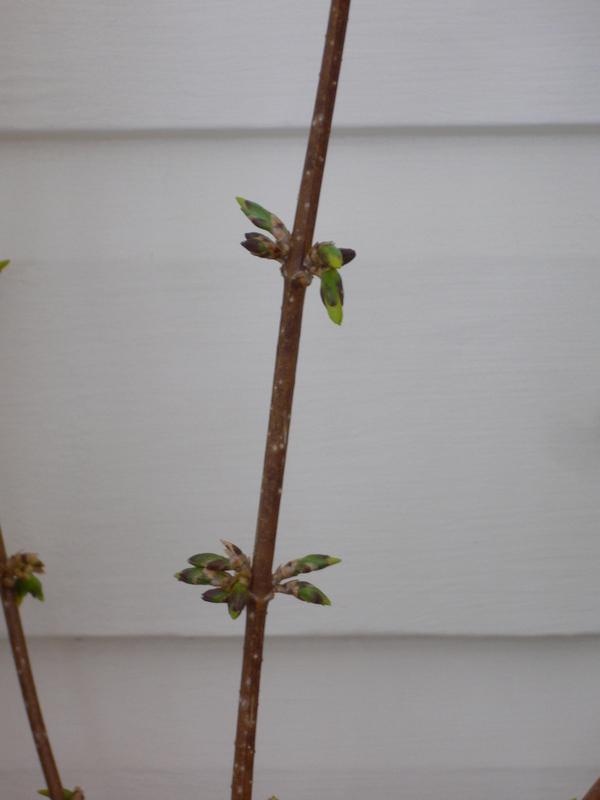 I have not done much pruning while the plants have continued to grow with abandon. The result is a nearly impenetrable mass of stems and leaves that occupies the upper third of all six supporting cages. 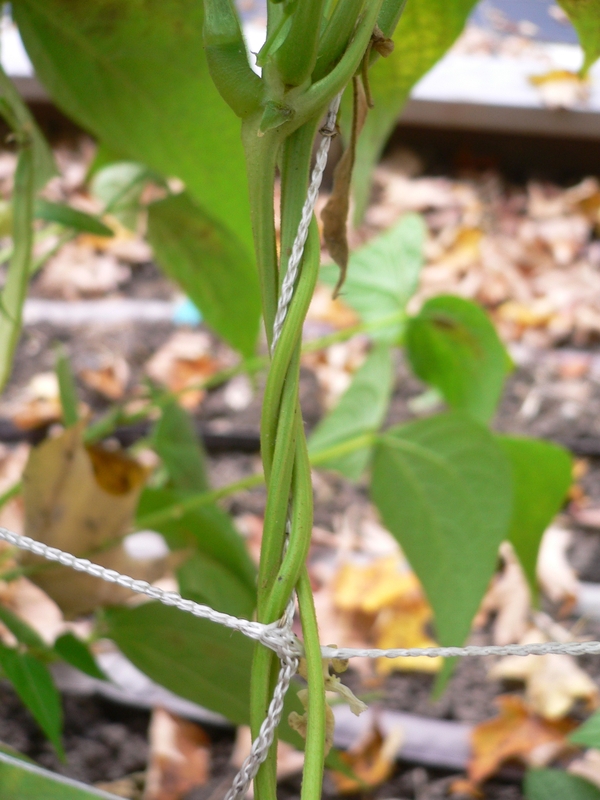 We have had to drape vines from each plant across the cages of one or two adjacent cages in each direction. 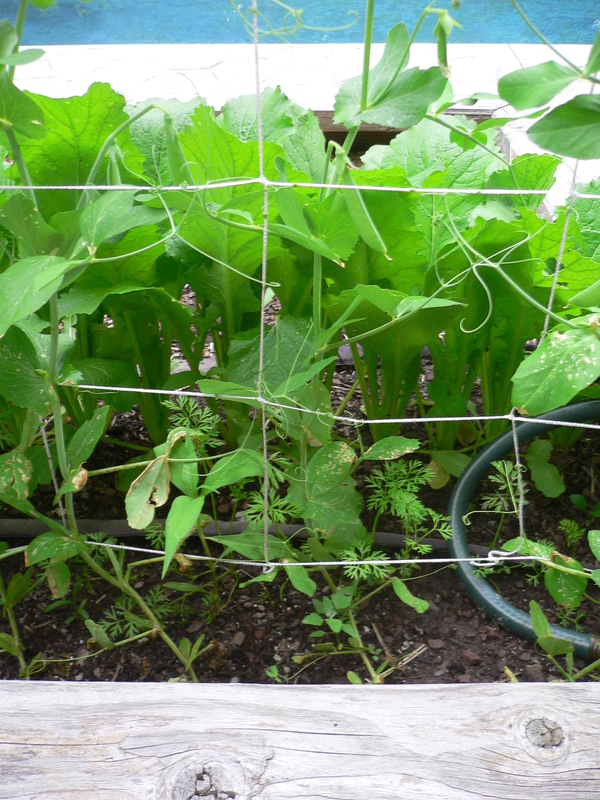 At the ends of the east planter, the vines reach out into space, looking for something to grab on to. It makes walking around them more difficult. In addition, the unbalanced weight of the developing fruits is causing the cages to lean precariously this way and that. 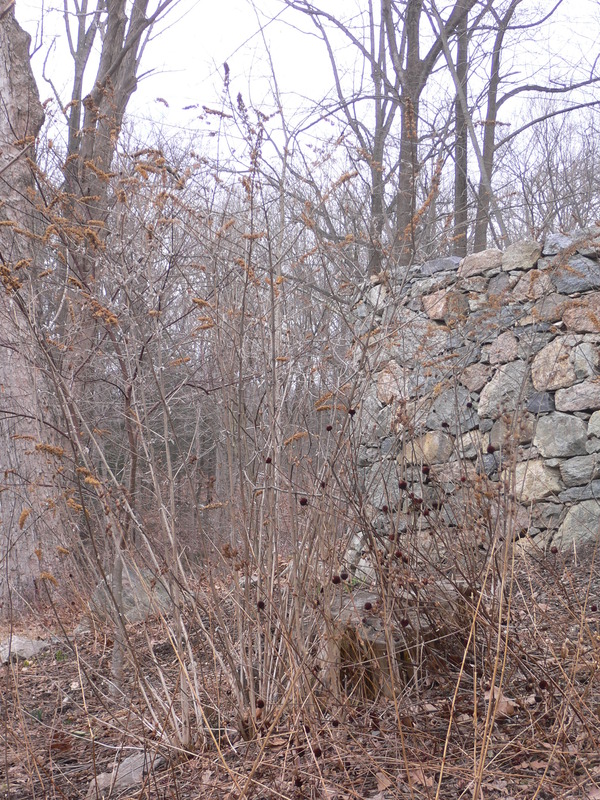 We had braced them securely in the spring (this condition seems to be inevitable regardless of the size of the vines) and had we not done so, the cages would surely have toppled over by now. Who knows what is going on in that tangled clump of vines—and with whom? Hornworms may be munching away for all I know. 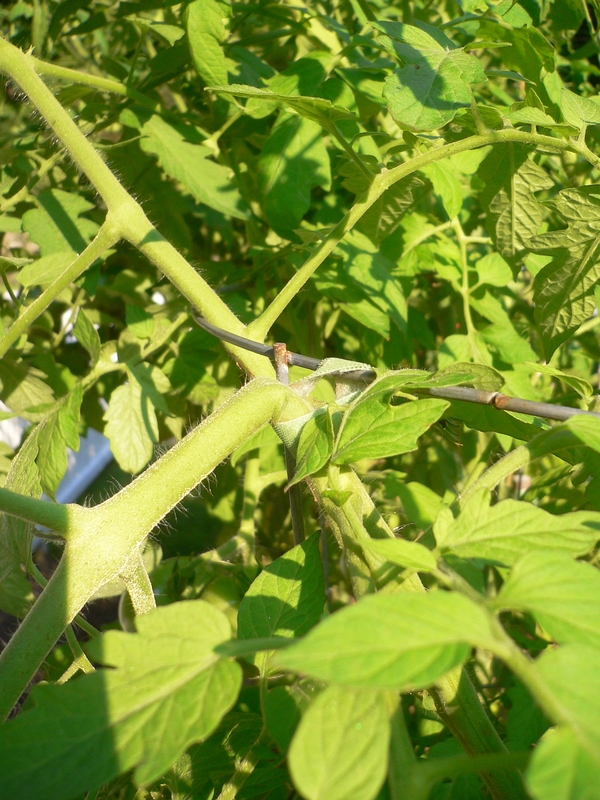 And with each plant intimately enmeshed with the others, if one contracts a tomato disease, they will all get it. 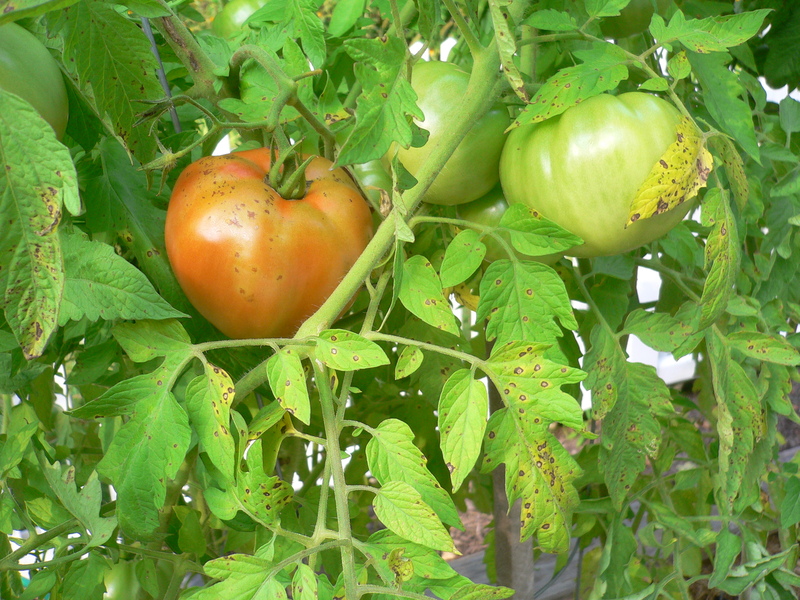 Luckily, there has been no sign of either, with the possible exception of some freckled and yellowed branches of the Country Taste beefsteak tomatoes. 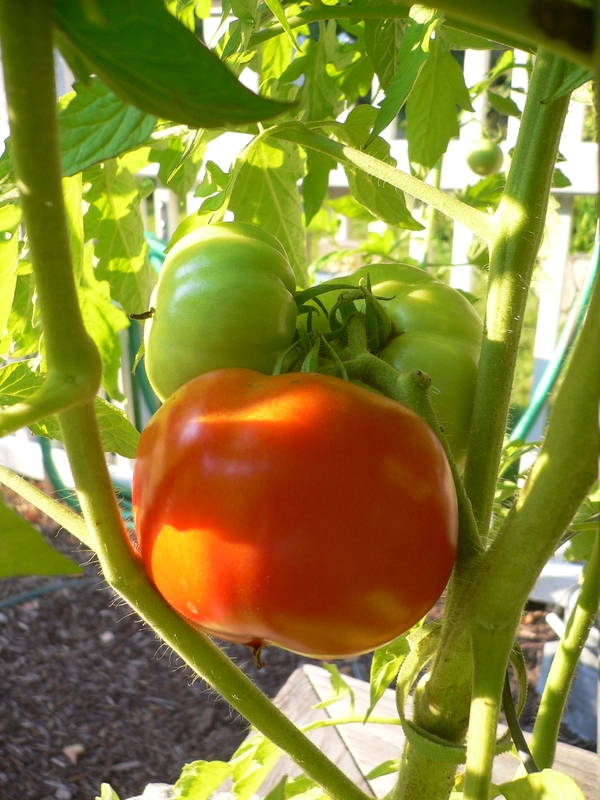 The upside, of course, is that there are plenty of tomatoes of all varieties. 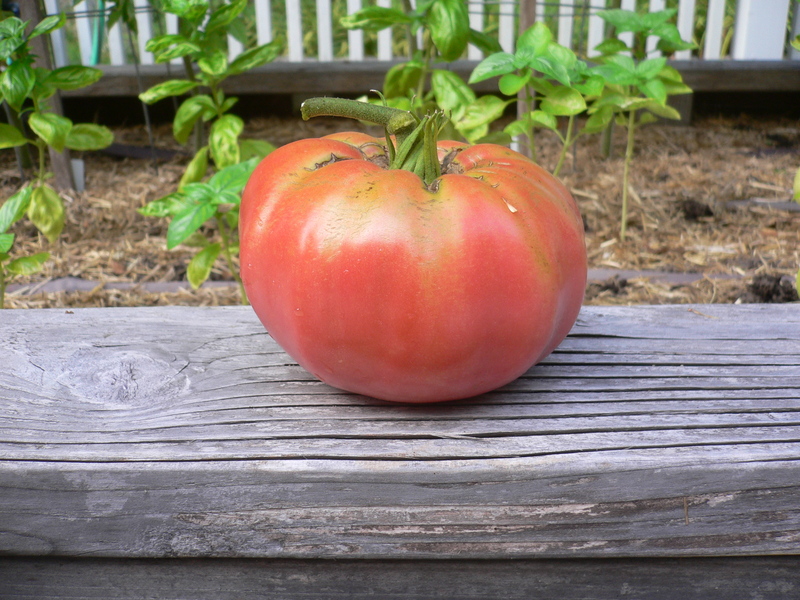 The beefsteaks are the most plentiful—there must be dozens of them, in all stages of development—while the Brandywines (which we think look more pink than red) are the largest. We picked a husky specimen last week that must have weighed two pounds. We could have made a pot full of sauce using just the one tomato. 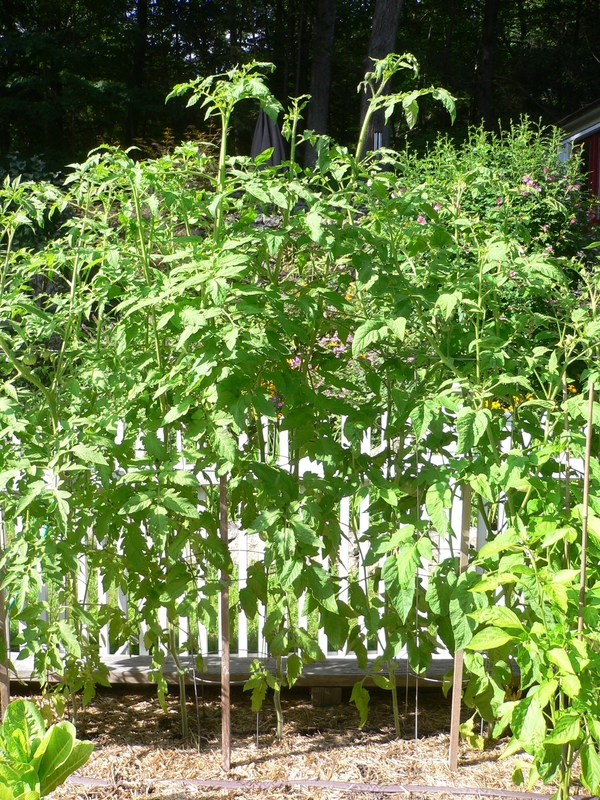 The tomato plants have been soaking up the solar radiation and heat (and not a little water, too) these last few weeks. Consequently, they have shot up about 18 inches above the top of their cages. 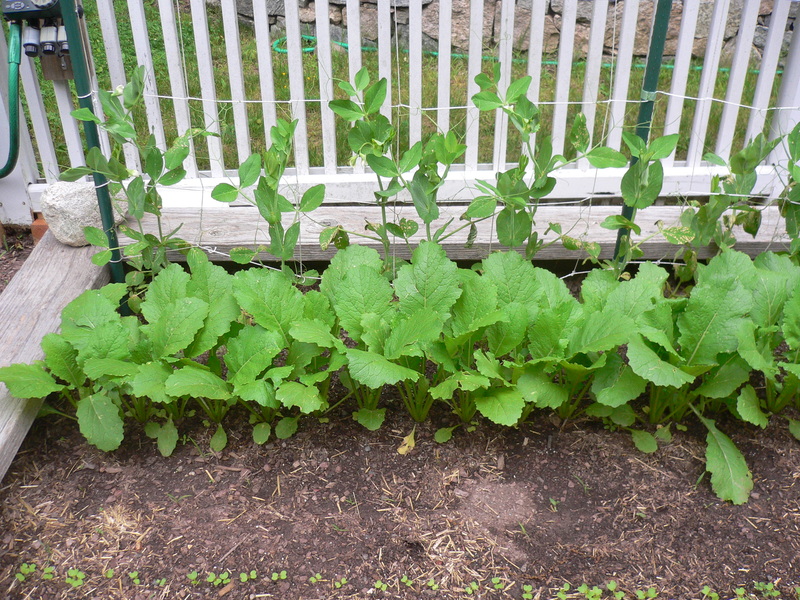 The plants are now about five feet tall and I think they would keep on going higher if they could. And, come to think of it, maybe they can. 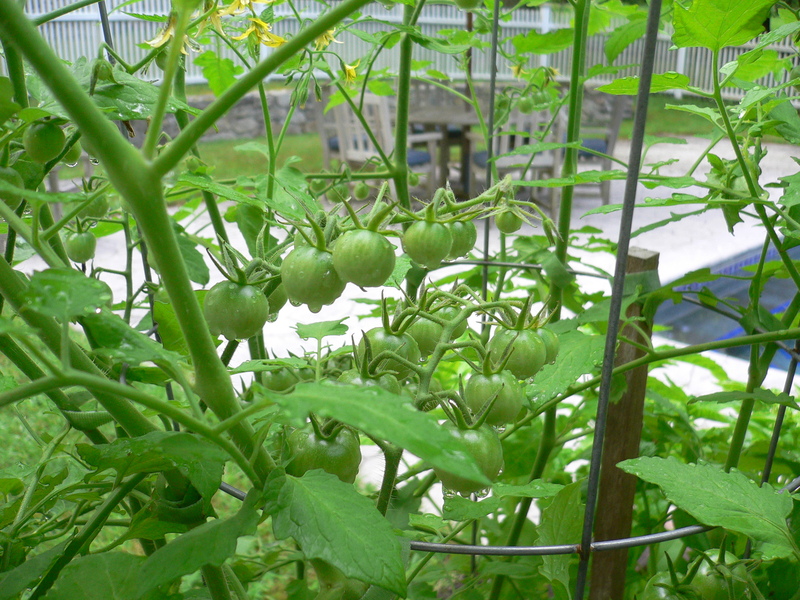 At this point, however, we want to check their upward growth and have them divert their energy to producing fruit. So we chose (somewhat arbitrarily) a point approximately one foot above the highest rung of their cages and trimmed of the main stems and branches that projected above this reference plane. It was not quite as easy as it sounds. 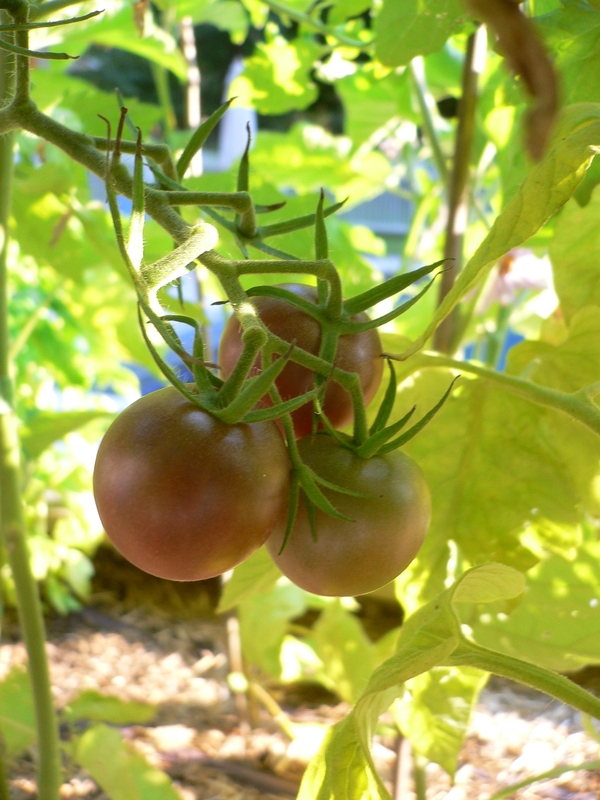 If the tomatoes were a hedge, I could simply give them a buzz cut, with no regard for branches, leaves, flowers or fruit. 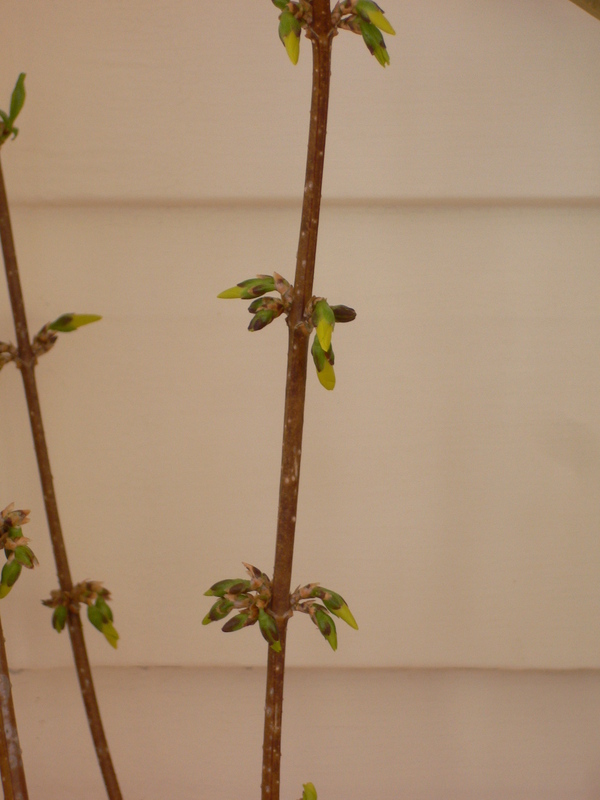 But because the stems and branches are growing in all directions and because some have already sprouted blossoms, we had to consider each cut independently. The goal was to trim off only the parts that are superfluous. 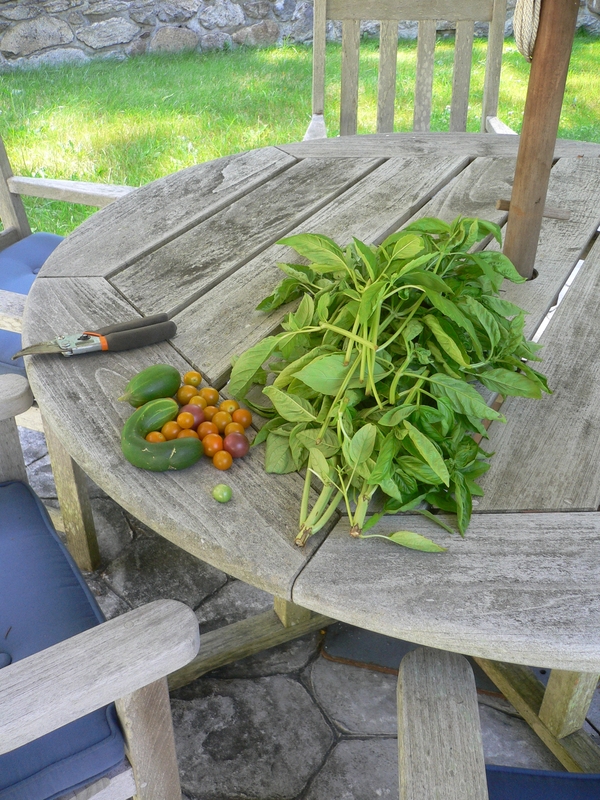 As it turned out, we did not have to prune that much and lost only a few branches that would eventually have produced tomatoes (nothing was beyond the newly-formed blossom stage). We made sure that all of the branches were securely tied and nipped most of the suckers that, if left to grow, would make the vines unruly. Both the east and west planters are now completely occupied but we’re not done for the day. 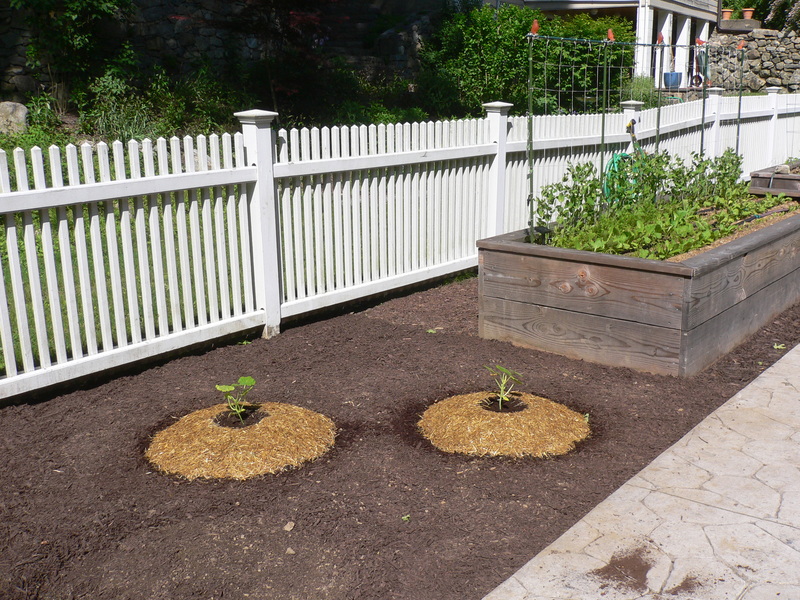 This year we are thinking (and moving) outside the boxes and planting vegetables directly in the ground. Yesterday, we removed the sod (see May 26, 2013) from the now-sunny area west of the west planter and covered it with mulch. 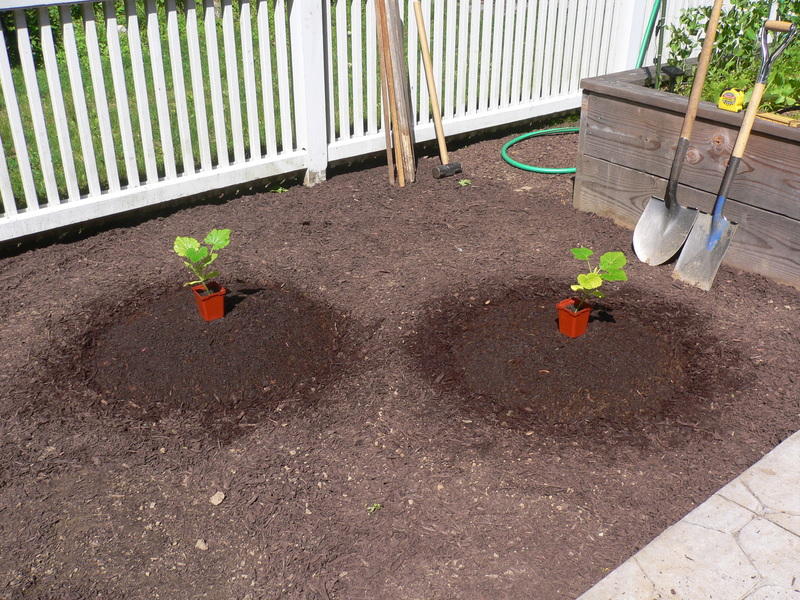 Today, we laid out the locations for the six mounds on which the squashes will grow. A week ago, we had figured three-foot-diameter mounds spaced at three feet on center (see May 19, 2013) but looking at my sketch today, I noticed that I didn’t leave any walking space at the far end. As I reconsidered the layout, I realized that because we are staggering the mounds, they can be spaced closer together. We adjusted the west walkway from 2’-0” to 1’-9” and the spacing from 3’-0” to 2’-9” and were able to gain 1’-9” at the west end (I find the symmetry to be pleasantly reassuring). 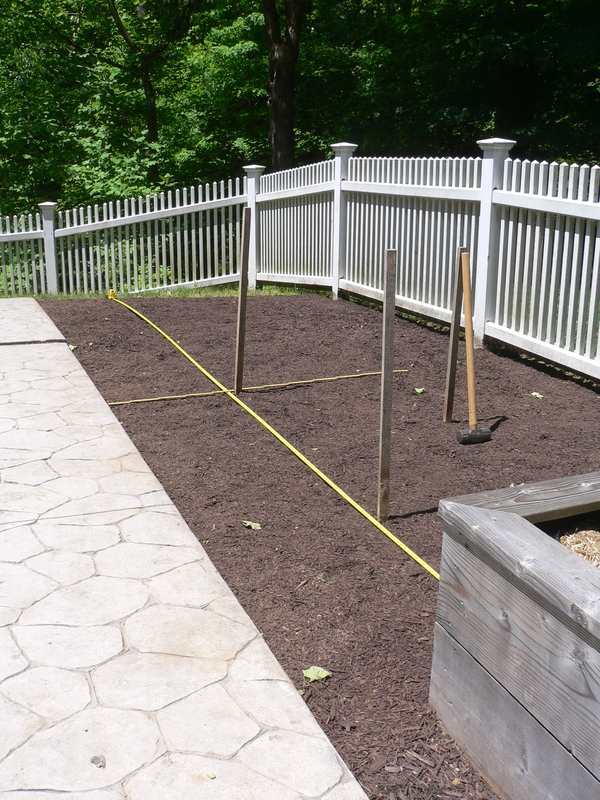 This will be very helpful because the grade drops off steeply just beyond the garden area. We extended a measuring tape along the ground longitudinally to form a baseline and then used a carpenter’s rule to measure the offsets in the short direction. At the center of each mound, we pounded in a wooden stake. 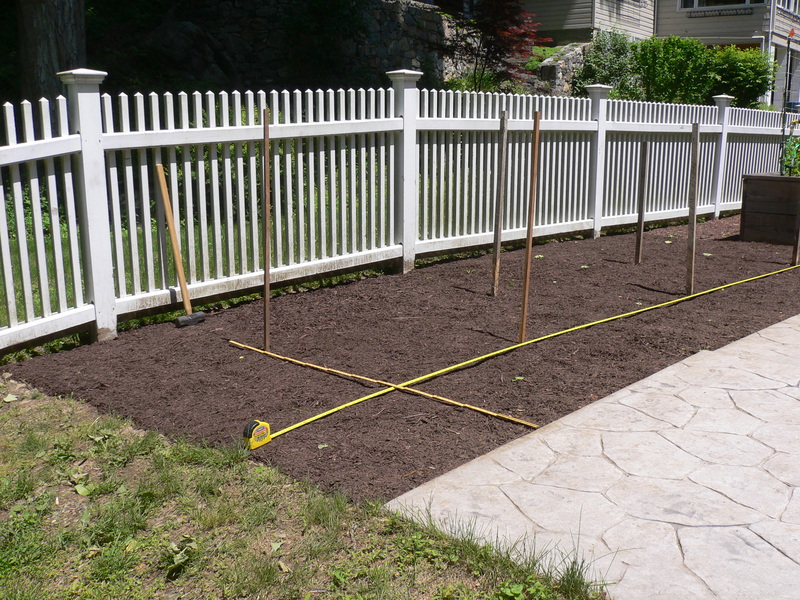 After setting each stake, we checked our spacing both longitudinally and diagonally (we calculated that each mound should be about 3’-10 1/2” from its kitty-corner neighbor) and everything checked out. When we got to the end, however, the final dimension looked a little short. In fact, after measuring it I found that it was off by 3 inches. In setting out the stakes, I had forgotten to reduce the first dimension (measuring twice doesn’t help if you are using the wrong number!). We could have moved all of the stakes but decided that what we had was good enough. 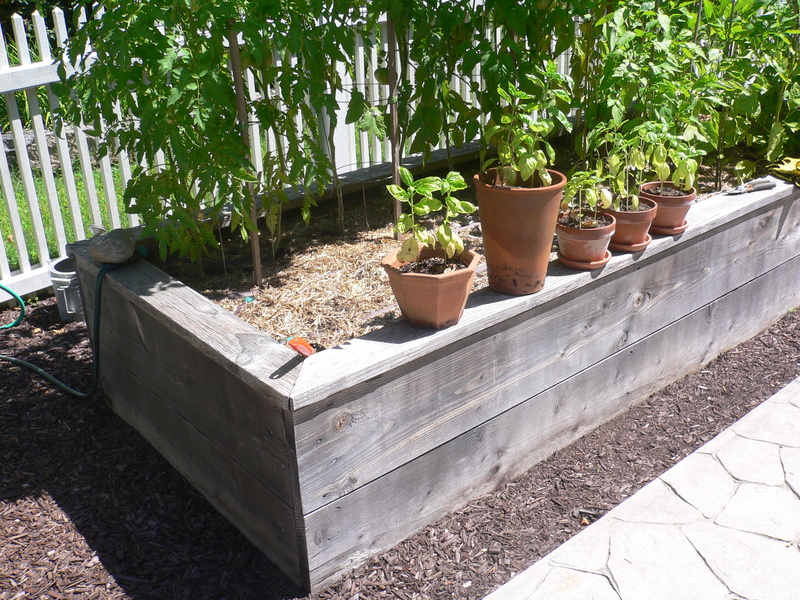 Plus, having more clearance next to the planter is probably better than having symmetrical edges. 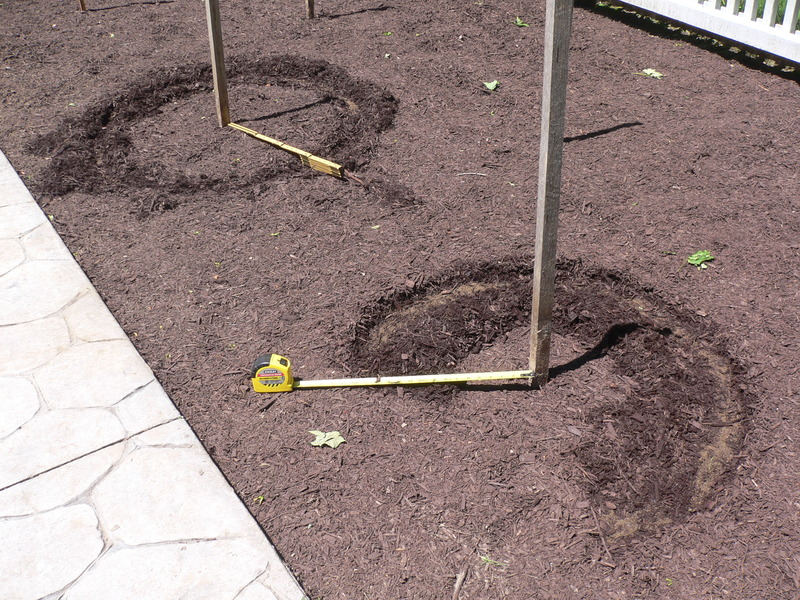 Next, we set our tape measure and rule to 18” and, placing one end against each stake, slowly rotated around it, removing the mulch to create a three-foot-diameter clearing. 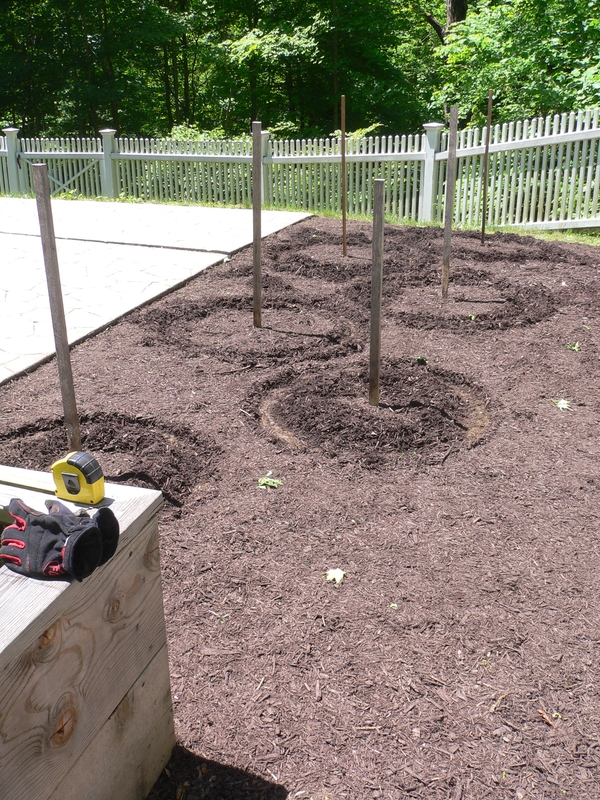 We redistributed the mulch to the surrounding areas and were left with what looked like a small set of crop circles (we’ll keep an eye out for alien invaders). Then, we dug. Or, more accurately, we picked at the soil with shovels. As I have noted many times before, the soil in this part of the yard is fill brought in during the pool renovation many years ago. 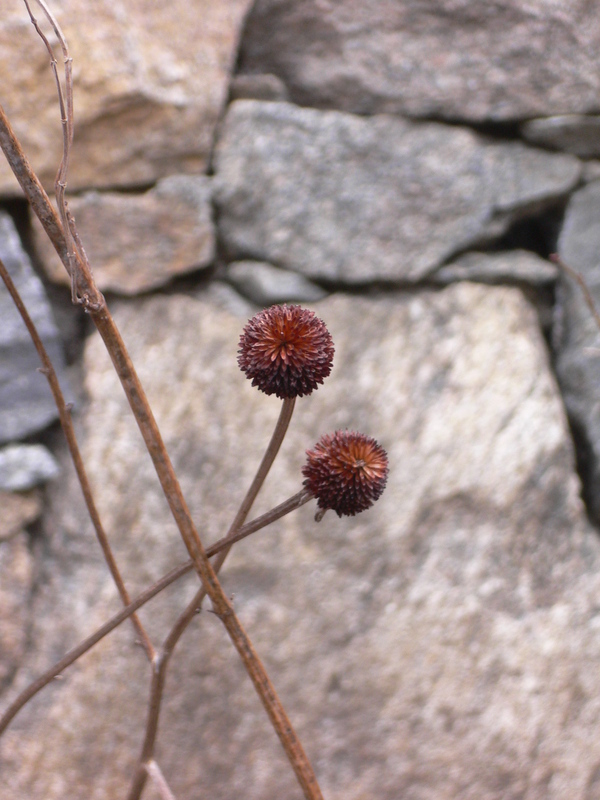 It is not of very high quality (from a gardening point of view) and is composed primarily of clay and rock. 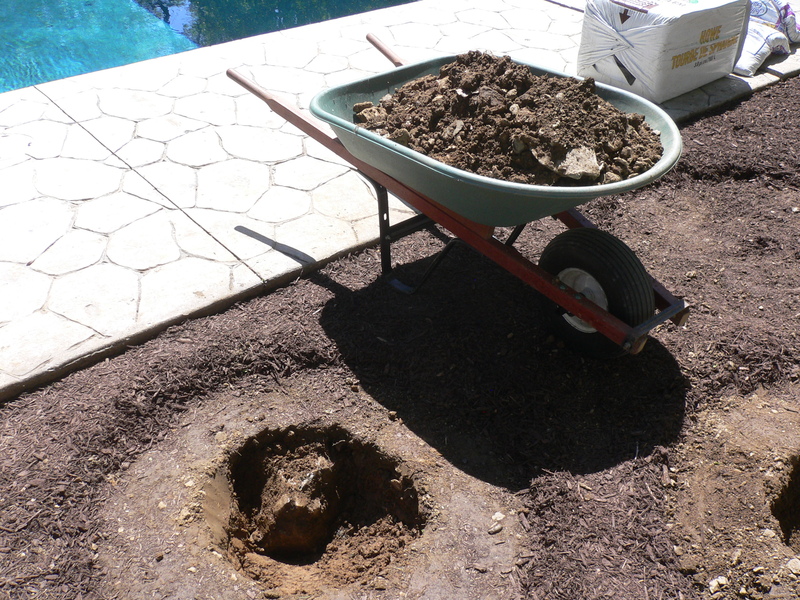 Digging it is a slow, tedious project (the kind of task usually given to prison inmates). 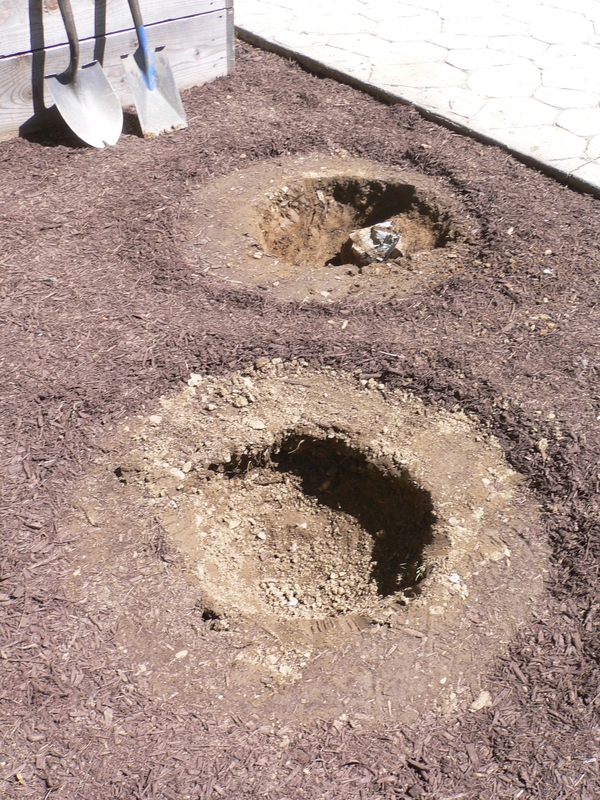 After an hour of hacking away, each of us had dug one hole about 16 inches in diameter and six inches deep. A large rock protruded into the hole I was digging and even with both of us working on it, we could not get it to budge; the squash plant who will live here will just have to work its roots around it. Because it was getting late in the afternoon, we opted to plant these two locations and come back to the others later. 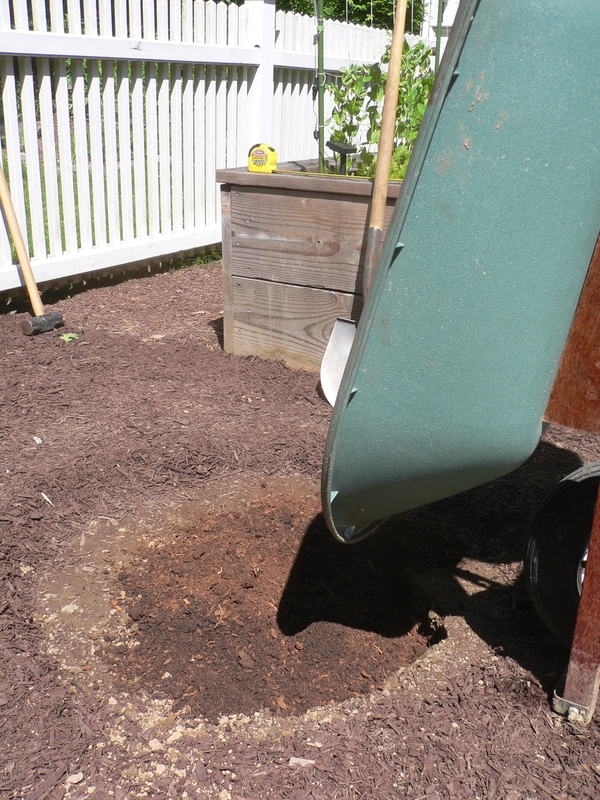 To fill the hole and create mounds (to elevate the plants above grade), we combined equal parts (roughly) of compost and peat moss, using the wheelbarrow as a mixing bowl. 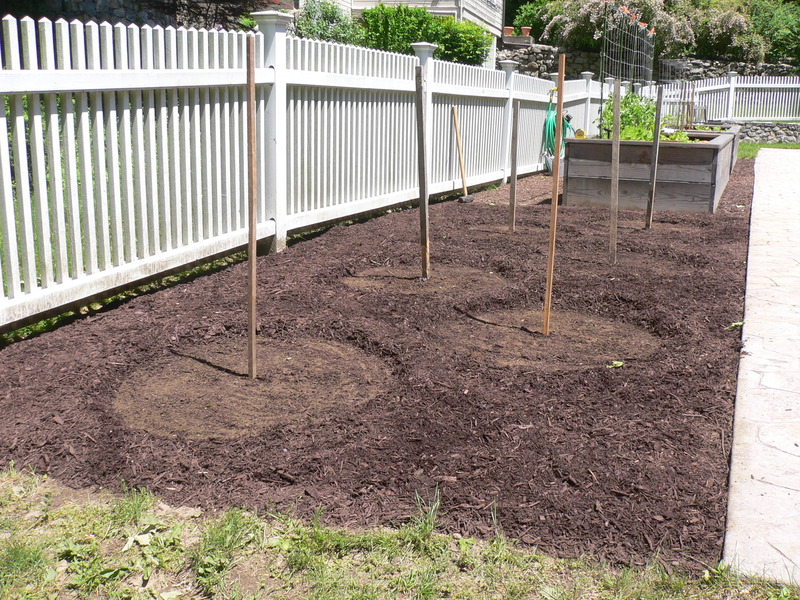 I dumped the soil into the holes and Rachel formed it into mounds. At the top of each mound, we dug a small hole into which we placed a summer squash seedling. Finally, we covered the mounds with straw mulch. 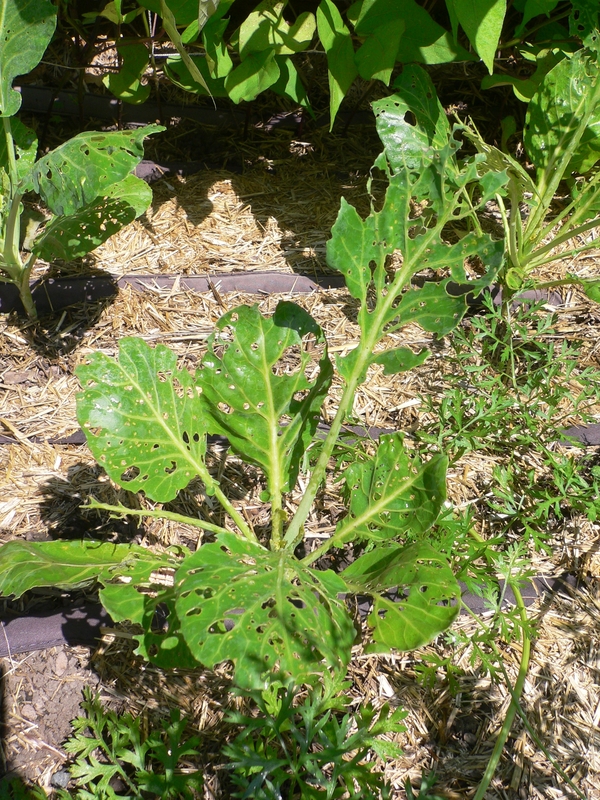 In addition to helping the soil to retain moisture and discouraging the growth of weeds, the mulch should prevent the soil from washing away in a heavy rainfall (of which we can expect many over the course of the summer).